This review is long overdue. I am not exaggerating when I say I had four separate photoshoots for this thing, in at least 3 different states, each time dissatisfied with the results. This pen DESERVES beautiful pictures, because this is a beautiful pen. This pen is small—though NOT Jetpens’ smallest, in spite of the claim on the Liliput’s page; the Liliput is 3.8 inches capped per Jetpens, and the Ohto Rook, per Jetpens, is 3.7 inches capped. HELLO, SOMEONE AT JETPENS PLEASE FIX THIS INACCURACY THANKS. In spite of being 0.1 inch shy of smallest, the Liliput still boasts an impressively diminutive profile among compact fountain pens. Posted, I believe the Liliput is the smallest of these pens, but not so small as to be uncomfortable. I can even write with the cap off, no problems, but that has more to do with my weirdo-grip than the length of the pen. One of the pen’s greatest strengths is also one of its biggest inconveniences. The cap unscrews to come off, and screws onto the back to post. The cap is very sturdy, once posted. But this is not a maneuver suited to quickly jotting something down; the rounded end doesn’t give enough purchase for the cap to line up and easily catch the thread, and it often takes me a try or two before I get the cap screwing on correctly. I do a little better if I sit here, focusing on the task, practicing—but focusing on getting the cap lined up is not my greatest strength when I’m trying to remember something I want to write down. On the one hand, I love the barrel. Smooth. Uninterrupted. Slips into a pocket like it’s greased down and dripping with butter. On the other hand, this pen is CONSTANTLY rolling off and away (apparently none of the tables in my life are level) any time I set it on a flat surface without a book, additional pen, or some other object to chaperone it. I don’t know what I would do to fix this problem; I love the look of the pen. I don’t want some ugly bump protruding from any part of it, nor do I want the body to be anything other than rounded. I don’t want a clip. I want this pen to defy gravity, just a little bit. That’s the only reasonable solution I can come up with. On to the writing portion of this never-ending talent show. 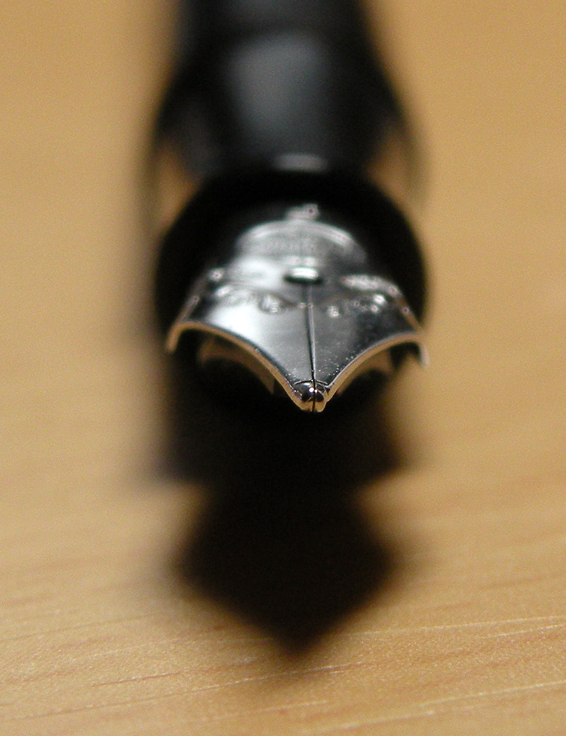 The nib writes tactile-smooth; you can feel the nib on the page, but it doesn’t drag. Ink flow is nice and consistent. My only beef is that this fine nib seems to write just as fine as my medium nib; which is to say, I perceived no difference at all. I don’t know what the deal is. 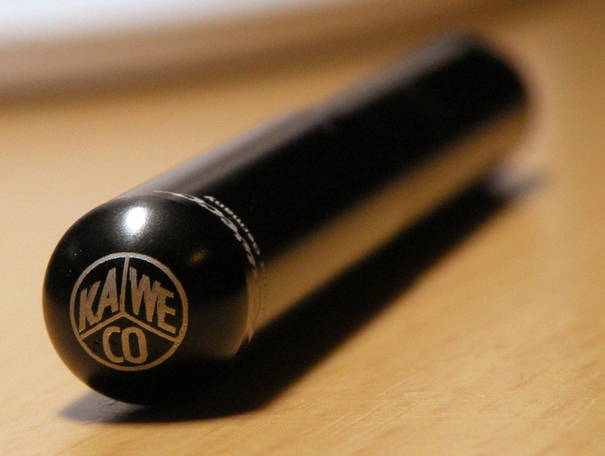 Maybe nib size for the Kaweco brand is just a game of Russian Roulette. Maybe you’ll get the nib size you want. Maybe you’ll get shot in the head and have vodka poured on you. Who knows. Top: plunger all the way out. Middle: plunger all the way in. Bottom: amount of room left when I put the empty converter in the Liliput and screwed the body back on. I guess there’s theoretically enough room there for a drop, maybe two, of ink. Feel free to knock yourselves out trying. 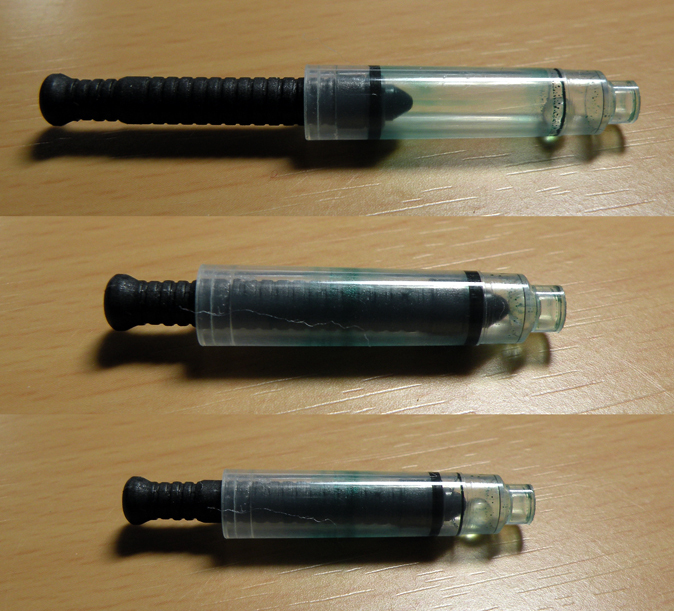 I’d say your best bet is to get a little syringe and use it to fill up an empty cartridge with the ink of your choice. All the king's horses may have trouble with Humpty Dumpty, but I have opposable thumbs and no trouble reassembling this pen. I think the biggest hesitation point for this pen is price. I got it at $53; the price has already increased to $55 (metal prices are going up, I hear). Now, I’m both cheap and poor, so this is a lot of money to me. For moneyed professionals and sensible people who save money wisely, and basically anyone other than me, have no hesitation buying this pen. If you’re like me, and you want this pen but $55 seems like more than one should be spending on any pen, wait one day for every dollar it costs, and if you still want it, get it (that’s what I did). I haven’t been disappointed, despite the few drawbacks. It’s adorable, writes well, and is constructed of quality materials. And JetPens just rolled out replacement nibs, for those of you who can’t decide between sizes; get one Liliput, and then another nib to go in it. 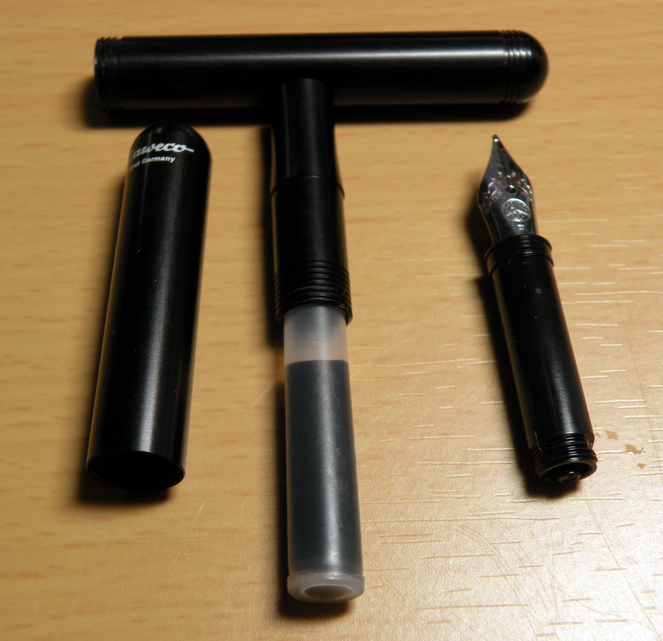 1) I find myself getting tired of my Kaweco classic. I don’t enjoy posting caps, so having to post it all the time in order to write comfortable, even short notes, is becoming a chore. 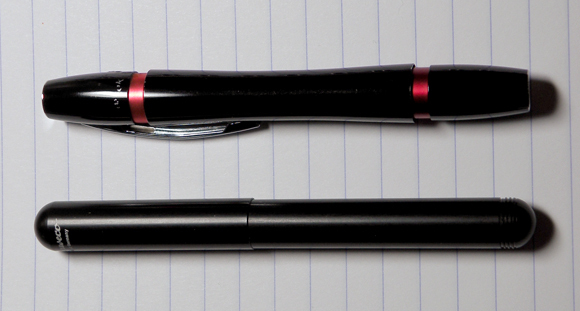 2) These pens from established manufacturers are becoming horridly expensive. I can’t help but to compare every pen with the TWSBI. Why is it so hard for them to come up with better prices thanks to economies of scale? I have the Kaweco Classic and I just don’t like how the barrel is getting scratched up from posting. My Stipula Passaporto (FPN LE Edition) on the other hand handles that nicely by having the cap screw on when posted. 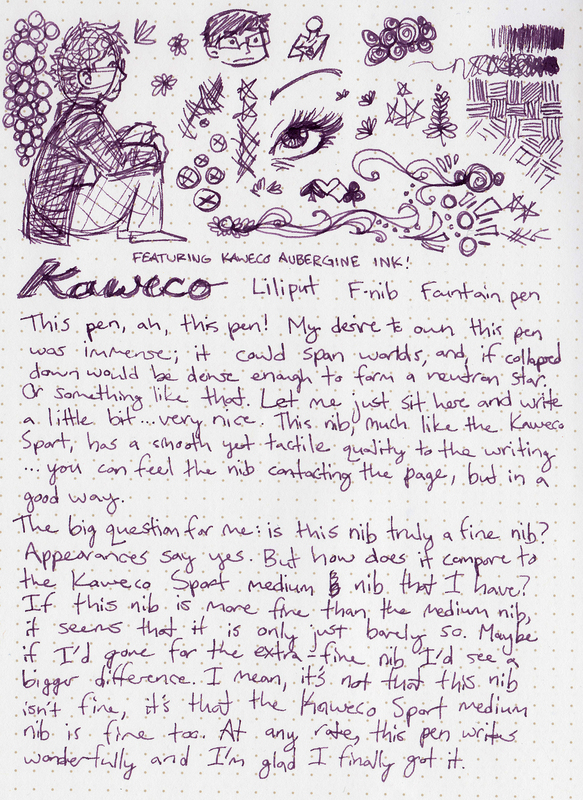 I just like the nib on my Kaweco better. I have the Kaweco AL Sport EF in my cart, going to order today! I hear you on the concerns over scratching. I’ve got a Lamy Al-Star that I got in June that’s already had paint scratch off the cap. Let me inspect my wee Kaweco…I’ve had it since around the 10th or so of October, and I’ve DEFINITELY dropped it several times on hard ground…looks like I’ve got two points, not even as big as if I’d made a dot with the sharpened lead tip of a 0.3mm pencil where, in the right light, you see silver…and if you look in the last close-up picture of this post, near the C on the cap, you can see a scuff (but no silver) from the worse of where I dropped it. Maybe go for the silver if scuffs and scratches are a concern? Bluh, speaking of price hikes, I’m glad I bought my Lamy Dialog 3 when I did; I hear the list price is due to go up soon. Better check my wish list for any other metal body pens and nab ’em before they go up any more. I placed the order already! I saw the photo. They don’t really show that much and I guess there’s nothing wrong with a worn out pen, think of it as its aging process if that makes any sense! Yeah it seems that’s what is happening! I actually don’t buy pens from my own money, I don’t even have my own money, my mother or father are the ones who pay. When it’s from Jetpens it’s always my mother. I feel bad sometimes but it’s not like I can get a job, I’d love to be able to get a job and pay for my own pens and other fascinating things. I really hope you are able to get all the metal body pens for a reasonable price! I was surprised Jetpens didn’t have like a Christmas/New Year discount! Would’ve been nice, right ? I have been salivating over this pen in the EF on JetPens for weeks. Thanks for the review. I think you pushed me over the edge. i’ve been eyeing this same pen forever, but i’ve been interested in the bp version. as a matter of fact sold some of my Kaweco sports on ebay to get the $ to buy the Kaweco Liliput BP and just bought it tonight!! yah!!! !